What’s Life as a Commuter Like? Commuters – they simply drive to school and back, so what’s the big deal? Commuters are often overlooked people on campus, and the big deal is we need to give them more attention. Sure, they may be recognized as students, but we often forget to focus on their specific struggles on-campus students don’t face. Justin Stimpson is a married man, works part-time off campus at a local church, is a full-time student, and happens to be the student commuter liaison on campus. Stimpson was clear that he didn’t want to be singled out because at the end of the day he is just a commuter like all the others, but he plays a unique role at Messiah. “I’m (trying to) synthesize a lot of voices into one consistent voice, that there’s a need here,” says Stimpson. That need he is describing is for commuters to feel like they’re a part of the community that exists at Messiah. With roughly 375 undergraduate commuters currently enrolled at Messiah, this years’ first-year class welcomed its largest number of commuters yet with 125, double from the past two years. “The commuting student body at large is starting to feel like they’re being noticed. Before recent actions were taken, the most interactive thing would be a poster in the commuter lounge saying to email Wendell Witter or call the Commuter Services, but that’s not developing interpersonal relationships,” says Stimpson. One of the problems associated with parking at Starry is it often makes some students late for class. While six or seven minutes may not sound like much, commuters have to factor that into their morning routine to ensure they’re not late for their 8 A.M.
Commuters face a multitude of struggles in addition to the normal stress of managing time between school, work, and extracurricular activities. Since some commuters live more than an hour away, they try to schedule all of their classes on MWF or T/R to use the off days for homework or a job, among other responsibilities they have. Sadly, there are many snags with that type of planning. For instance, many commuters are transfer students and don’t have many credits. The only available time slots for classes are at odd times throughout the day, and it can create schedule conflicts. These are just some of the struggles commuters go through, but they don’t want to be viewed as constant complainers. They save their money and can do things like sleep in their own beds on a nightly basis and spend more time with family. Stimpson was clear that there are positives, but there is still work to be done – and hope. Stimpson shares that the SGA, in particular, has been intentional in showing care towards commuters and taking steps to address their needs, “They literally put their money where their mouth was,” he says. The concern from administration at Messiah is there as well, but Stimpson believes it’s just a matter of garnering that concern and turning it into actions to see a turning point. “I would definitely give the commuters a greater lounge space if I was king of the world at Messiah,” says Wood. He sees a big need for commuters, but space isn’t available at the moment. Wood did go on to describe that five years ago a website wasn’t up to notify commuters about happenings on and off campus like there is now, or a dedicated administrator for the commuters such as Wendell Witter. A word that Stimpson used over and over to describe those “next steps” was hope. “We now have a Lexmark printer in the lounge for WebPrint, so commuters don’t have to trek to the nearest academic building just to print out a page sometimes,” points out Stimpson. Last year Stimpson said a coat rack was added to the commuter lounge, so commuters had a place to put their soaking wet rain jackets or umbrellas. It’s the little things that he feels are helping change the idea of commuters not being a part of the community. The root ‘com-‘ means together. If Messiah is to be truly called a community and the body of Christ, it’s important to reach out to them and make them feel included. “When you commute, you go to your classes, and you talk to people in your classes and bank on making friends there. You constantly have to force yourself into social situations,” says Kimmel. Messiah College students can change that. Next time you meet a commuter, invite them to hang out with you – grab a meal, hang out with your group of friends, do something. It can be life-changing for a Messiah commuter student. 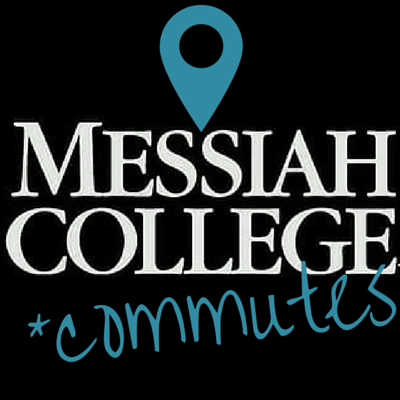 You can check out Messiah College Commuters on Facebook or @MC_Commuters on Twitter to keep up with campus commuter events!